The Nebraska Territory was an organized territory of the United States from May 30, 1854 until March 1, 1867, when Nebraska was admitted into the Union as the 37th U.S. state. It was established by the Kansas-Nebraska Act of 1854, and the territorial capital was Omaha. 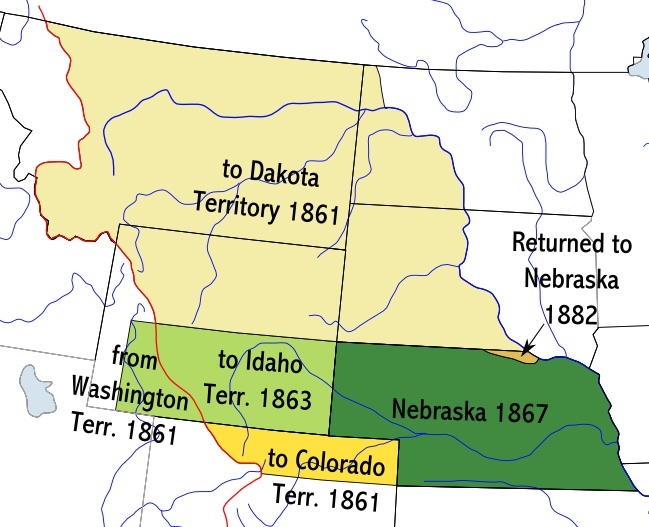 With the passage of the Kansas-Nebraska Act in 1854, Nebraska Territory was organized and opened for white settlement. It was settled extensively under the Homestead Act during the 1860s. Sources and Additional Reading: Chokecherry Places, Essays from the High Plains, Merrill Gilfillan, Johnson Press, Boulder, Colorado, trade paperback, ISBN 1-55566-227-7; Olson James C. and Ronald C. Naugle History of Nebraska 2nd ed (1997); Andreas, Alfred T. History of the State of Nebraska (1882); Creigh, Dorothy Weyers. Nebraska: A Bicentennial History (1977); Faulkner, Virginia, ed. Roundup: A Nebraska Reader (1957); Hickey, Donald R. Nebraska Moments: Glimpses of Nebraska's Past (1992); Miewald, Robert D. Nebraska Government & Politics (1984); Luebke Frederick C. Nebraska: An Illustrated History (1995); Morton, J. Sterling, ed. Illustrated History of Nebraska: A History of Nebraska from the Earliest Explorations of the Trans-Mississippi Region. 3 vols. (1905-13); Wishart, David J. ed. Encyclopedia of the Great Plains (2004).